The Freedom From Religion Foundation is chastising a Louisiana school district over unconstitutional prayer gatherings that recently took place at many of its schools. 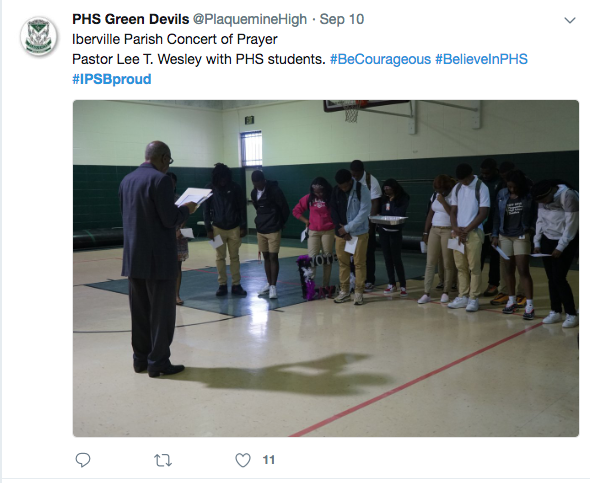 A concerned member of the Iberville Parish School District community contacted FFRF about the Concert of Prayer, a districtwide affair held on Sept. 10. This event was apparently organized by the district in partnership with the Plymouth Rock Baptist Church of Plaquemine and occurred during the school day within several Iberville Parish schools, including Plaquemine High School and Crescent Elementary School. This school-endorsed religious event also reportedly involved district employees joining students in prayer. Additionally, Pastor Lee T. Wesley of Plymouth Rock Baptist Church led a prayer for students at Plaquemine High School. Public school teachers may not lead their students in prayer, encourage students to pray, participate in student-initiated prayer, or otherwise endorse religion to students, FFRF reminds the school district. “The Supreme Court has continually struck down teacher- or school-led prayer in public schools,” FFRF Associate Counsel Sam Grover writes to Iberville Parish School District Superintendent Arthur M. Joffrion Jr. “The district has an obligation under the law to make certain that ‘subsidized teachers do not inculcate religion,’” to quote the court. It is not a violation of the free speech rights of teachers when a public school regulates what they promote to students while acting in their official capacities, since teachers have access to a captive audience of students due to their position as public educators, FFRF points out. Similarly, it is inappropriate and unconstitutional for public schools to invite a Christian pastor to proselytize students. When a school allows church representatives to lead students in prayer, it has unconstitutionally entangled itself with a religious message — in this case, a Christian message. This practice alienates those non-Christian students, teachers and members of the public in the school district whose religious beliefs are inconsistent with the message being disseminated by Pastor Wesley. Nothing in the law prevents students, teachers or district employees from freely exercising their religion on their own time and in their own way, FFRF emphasizes. But a public school itself must not promote decidedly religious messages to a captive student audience, thereby isolating and excluding those students who are non-Christian or nonreligious. FFRF is asking the district to do a number of things. It must investigate this situation and ensure that all of its employees abide by their constitutional obligations. It should issue a public apology to district parents and students. And it must cease its partnership with the Plymouth Rock Baptist Church of Plaquemine and no longer allow Pastor Wesley, or any other religious leader, to lead students in prayer. FFRF is also requesting all records related to the Sept. 10 prayer event. The Freedom From Religion Foundation is a national nonprofit organization with 32,000 members across the country, including in Louisiana. Its purposes are to protect the constitutional separation between state and church, and to educate the public on matters related to nontheism.